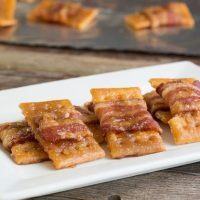 Sweet Bacon Crackers are an easy bacon appetizer recipe. Caramelized bacon wrapped crackers. Sweet, salty, portable and addictive. 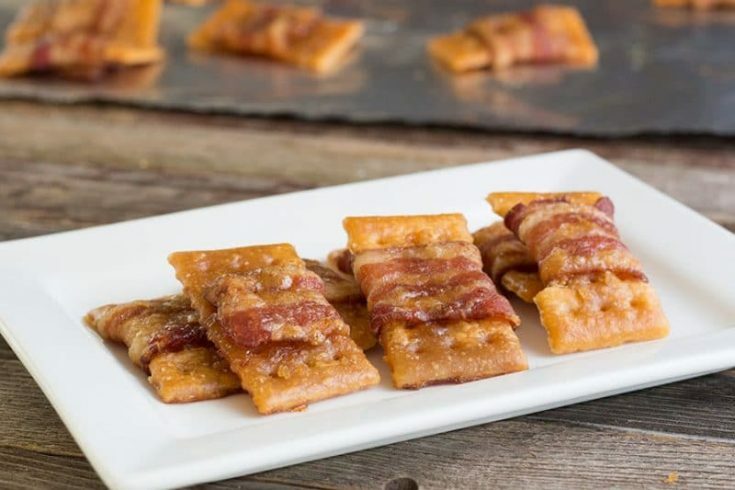 Sweet Bacon Crackers are an idea that has been running around the internet for quite some time. Lord knows I have looked at a few of them, so it is hard telling which one was the first one I saw. It is also hard to tell if there was any particular recipe that I have used so I apologize to any other blogger out there who believes this recipe may belong to them. 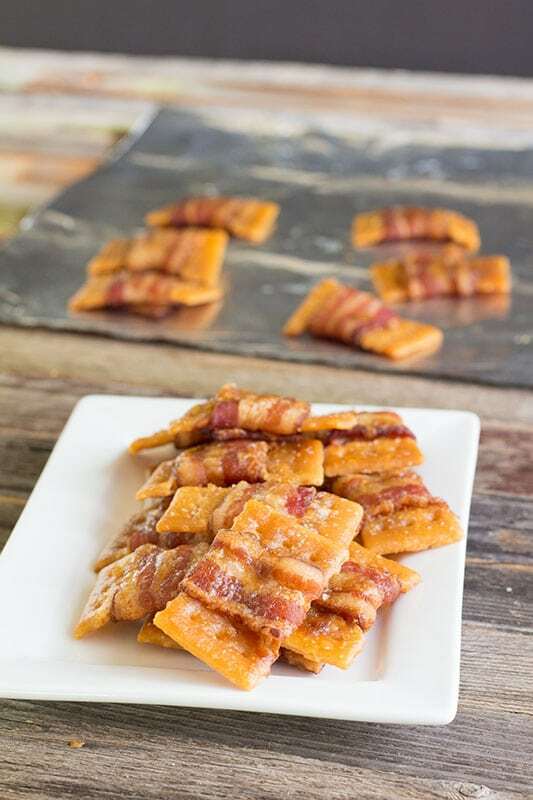 Bacon Crackers can be made with any type of cracker that you would like. I prefer the buttery small rectangles, only because I like the shape that this cracker becomes. Square crackers are also easier to wrap in bacon. All of the cracker types will shrink somewhat in the general area the bacon is wrapped. A few may even look like bow tie crackers. The key to keeping your bacon wrapped crackers together is to keep the heat high in the oven. If you cook these too slow, there is more time for the grease to absorb into the crackers and they will be soggy in the middle. But if you like your pork fat, this might be the way you want to cook them. The second best tip for bacon crackers is to use thinly sliced bacon. 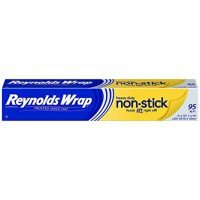 Be sure to use a non-stick cooking surface, like non-stick aluminum foil or parchment paper that has an extra layer of protection added by using baking spray. 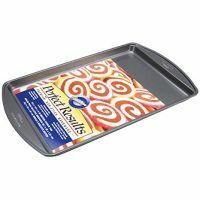 These may stick if allowed to sit for too long before removing from the baking sheet, even with extra levels of non-stick protection! Trust me, I have lost many crackers this way. The brown sugar and bacon fat will turn into hard caramel cement. Make sure you use a baking pan with sides! If you do not use one with sides you might find the bottom of your oven smoking or even a few dancing flames down there. Just trust me! Bake until the bacon is your preferred level of crisp. Bacon crackers taste best when the bacon is not flabby. I am not a fan of hard crispy bacon, so if your preference is crispy bacon yours may require more time in the oven than my recipe calls for. Give it another 3 to 5 minutes for crispier bacon. Watch these closely, bacon wrapped crackers will go from delicious to burnt in a flash. I make one small snack size sleeve if I am only serving 2 or 3 as a true snack. If I am serving a crowd I may use an entire box of crackers and 3 or 4 pounds of bacon. *For reference, there are about 30 to 36 club crackers in a single sleeve. In an ideal world, you could make 1 sleeve for a crowd when served alongside other snacks. In reality, bacon appetizers tend to go faster than anything else except maybe shrimp. The amount of bacon used also depends on the thickness of the bacon. I find that generic bacon tends to be thinner so I can get more crackers out of a package of bacon. This recipe for sweet bacon crackers represents an amount that is somewhere in between the two extremes, so please adjust up or down according to your own needs. Remember to follow us on social media using the buttons below. If you have tied this recipe, or any other recipe and liked them please show us some love and rate the recipe! Bacon wrapped crackers, sprinkled with brown sugar and baked to perfection are a delicious tailgate or party recipe. Sweet, salty, portable and addictive. Take bacon out of the refrigerator and allow to soften slightly. Prepare a baking sheet with sides by lining with non-stick foil or parchment paper. Spray foil or parchment with baking spray. Cut bacon slices into three pieces if using regular bacon, half if using center cut bacon. Wrap one bacon piece around one cracker. Lay on the baking sheet with seam side down. These can be placed close together, but not touching. Sprinkle the top of each wrapped cracker with brown sugar. Do not use too much or it will run off and create a hard caramel layer. Place into preheated oven and cook for 30 to 45 minutes. Longer may be required for crisper bacon. They can be frozen before or after baking! Bake for a few minutes longer from the frozen state. To reheat, bake at 250 Degrees F until heated through and crispy, depending on how cooked they were to start with, this could take 10 to 20 minutes. I made these easy bacon cracker wraps but added a bit of cayenne pepper to the brown sugar. It gave it just enough kick that was nice. Big hit at the party I brought them to. Thanks for stopping by and for pinning! Easy is my favorite style too!